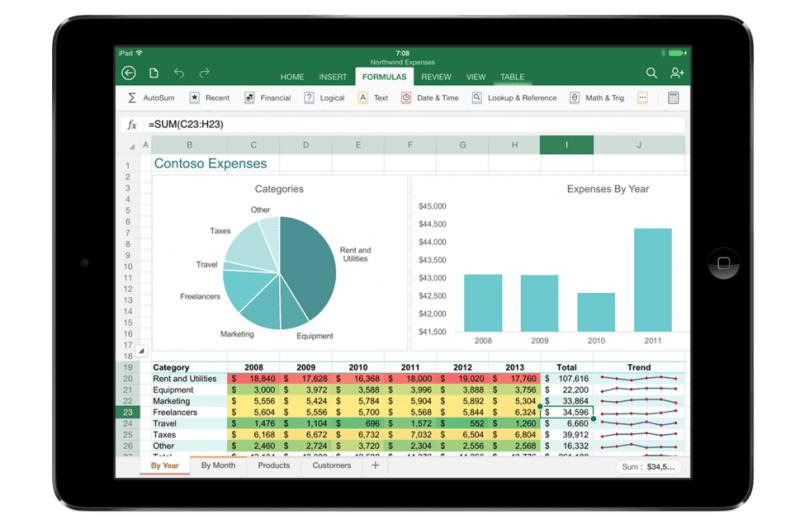 Microsoft on Thursday revealed Office for iPad during a press briefing in San Francisco as part of their goal of empowering people to be productive across all devices. The product has reportedly been years in the making but according to Microsoft, there’s good reason for that. This is an all-new version of Office built specifically for the iPad, not a ported version for Windows or a 2x zoom of the iPhone version. Microsoft demonstrated Office for iPad which certainly looks and feels like a native application for Apple’s tablet. For example, it’s easy to interact with content as everything can be done using the touch screen and there’s even built-in collaboration with rich reviewing and markups for editing. Excel offers a seamless experience with unique features like recommendations that use your actual data for previews and a custom keyboard with the functions you’ll use most. PowerPoint is also included in the suite although the company didn’t spend a ton of time discussing it in today’s media gathering. Outside of Office for iPad – clearly the biggest news of the day – Microsoft spent a considerable amount of time talking about the “intersection of mobility and cloud,” talking directly to developers and discussing the work of IT professionals. Office for iPad will be available for download starting at 11:00 AM PST for all users and it’s also part of Office 365. Microsoft is using a freemium business model so anyone with an iPad can download and use it to view documents and give presentations. Those wishing to edit documents, however, will need a subscription.